Plot: The charm and villain from the first Spider-Man, the emotional resonance of Spider-Man 2, the excess of Spider-Man 3, with that comic book feel. 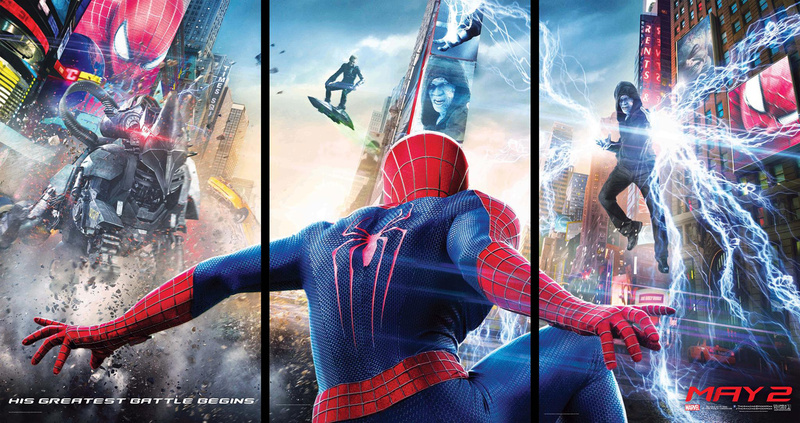 Review: The Amazing Spider-Man 2 is one of the most expensive movies I’ve ever seen. I wonder if, had these movies come ahead of the original trilogy what people would think of them. In terms of film cannon I think the first Amazing Spider-Man should be mostly ignored by audiences, but I imagine this one will be somewhat oddly under-rated because of the general critical reaction, the pessimism towards franchise fatigue and that although it is a good movie, it does not live up to its title or the previous heights of the franchise. This movie like the previous installment handles similar plot elements from the original trilogy. Namely Peter’s responsibility and the personal cost of being Spider-Man. Although this is well-worn territory for the franchise it is explored to greater effect here. What’s more is that Andrew Garfield’s Peter Parker unlike Tobey Maguire actually enjoys being Spidey both on and off-screen. This gives his conflict a lot more weight and adds to the emotional stakes of the film. Real-life couple Andrew Garfield and Emma Stone maintain their onscreen counterparts amid the movies crowded canvas. The chemistry between Peter Parker and Gwen Stacy is evident if you know of their off-screen relationship, which takes away some of the magic and spark the first film had. It’s a small qualm, but even though I don’t know the actors personally, it felt as if I was watching Andrew Garfield and Emma Stone rather than their characters. It’s a tiny distraction, though Garfield is a much better fitted to the physicality and comic persona of Spider-Man. Stone is fine as well but it feels like the writers fell into the same trap with Mary Jane Watson where they didn’t know exactly what to do with her. We need better writing for women guys! Jamie Foxx as Max Dillon makes for a sympathetic villain in the way of Electro’s tragic origins, the vulnerability he brings to the role and a killer soundtrack. Being one of my favourite parts he maximizes the roles potential, considering what feels like shortened screen time split with Dane DeHaan’s Harry Osborne. The last part of which can be said for him. In yet another differing and effective take on the Spider-Man universe, DeHaan plays Harry less dopey and more precise than James Franco did. He’s a smarter, more focused and more desperate character who feels both more dangerous and while retaining the same sort of patheticness appropriate for the character. In yet another unflattering comparison to the original trilogy it appears the actor actually wants to be there and it shows. The Amazing Spider-Man 2 cast with director and producers. The rest of the cast does ably well with what they have. Which is to say that the characters themselves are well drawn based on years of comic book lore with strong motivations, but the actions they take don’t always connect with other character threads. This is a bit expected from Marc Webb whose autonomous direction allows for everyone from the f/x department, to the rest of the cast and crew room to do their jobs, but lacks a strong unifying creative vision to bring them together. It’s a step up though from the first film as he demonstrates greater confidence in shooting the web-slinging action, which is among the most accomplished the franchise has seen. The CGI lays on the comic book heavy feel which instead of taking you out of the film like the hilariously cheesy goblin battle in Spider-Man 3, feels appropriate and therefore more absorbing. The web-slinging action is among the most accomplished we’ve seen in the franchise. The main disappointment comes from screenwriting team Alex Kurtzman and Roberto Orci. The blockbuster writing duo who previously worked on the first “Star Trek” and “Transformers” movies fail in their ability here to weave together compelling mythos from multiple plot threads. Because of this beyond the midway point the film starts to drag until the action gets rolling again. It all amounts to what feels like a cut and paste job. The film’s major flaw also could be attributed to producer interference, which is prominent on high budget films (why I’m crediting it) and had a hand in ruining Spider-Man 3, but at least the film handles its crowded canvas more deftly than that movie did. Having read a few of the comics, played a few video games, watched a few of the animated shows, Spidey along with the X-Men are the superheroes I am closest to and most familiar with. Like “Thor: The Dark World” due to an attraction to blockbuster spectacle (which this definitely feels) and an attachment to the overall canon, I would’ve seen this film no matter what, so it at least feels good to say that we have third great Spider-Man movie even if it doesn’t live up to its title or similarly named predecessor. Speaking before about character motivations and actions, I don’t really understand the Green Goblin’s role in the death of Gwen Stacy, it feels too soon to immediately buy Harry Osborne as a killer, considering he doesn’t even kill the guy who got him unjustly outed from his own company. I don’t care how sadistic Harry is driven by the goblin, the fact that they do all they can to build up Pete and Harry’s relationship over a few scenes isn’t enough to have the same impact or betrayal the previous franchise spent 3 movies building and doesn’t really make sense regardless of how close it hews to the comics. Also the idea that Harry needs Spider-Man’s blood to cure a genetic disorder is a neat thematic idea that unfortunately is not resolved by the end films end and is substituted for the goblin suit, never to brought up again. Perhaps I’m missing something? The biggest flaw affecting the crowded narrative is how the film goes on 20 minutes too long. The film swings high and should have landed on the death of Gwen Stacy or at least completed the encounter with Rhino. By setting up a third film with a lame cliffhanger ending that happens too soon after the climactic battle (plot wise not story wise) hinting at an expanded universe, and has barely anything to do with the events that just happened… it all feels too much. The film spoils itself and overstays its welcome and you unfortunately can’t go back on that. It only serves to infuriate you when you think about all the shots and scenes that seemingly serve no purpose beyond extending the films already long running time. Aunt May’s scene serving as a nurse in the downtown ER, kinda pointless. Gwen Stacy’s admission interview for Oxford, a waste of time. Demonstrating how much these character’s care for Peter is already duly implied and noted. I understand the popular trend of serialization and crossover influence from film and television narratives, but I miss the days when I just had to see one thing, clean and untainted by future promises, that was it. That is what this could’ve been, and it would’ve been spectacular. This is the first “Spider-Man” film to be filmed entirely in New York, and the largest film production ever in New York City. Shailene Woodley was cast as Mary-Jane Watson, and filmed scenes. but her role was cut to streamline the film. The film’s mid-credits scene teases Fox’s “X-Men: Days of Future Past”. Director Marc Webb had a 2 picture contract with Fox to make another film for them but instead signed on to Sony’s TASM2. This was allowed by Fox if Sony would agree to promote their movie for free. Jamie Foxx and Chris Cooper are the first Oscar winners to portray Spider-Man villains. Director Marc Webb chose to shoot on 35mm film instead of the digital Red Epic cameras the original was shot with, a rare example of a franchise switching to film after being shot on digital. If Marc Webb and producers could cut it with the cloying sentimentality that would be great. We get it, New Yorkers are brave and look out for each other, NEXT. It was one of the lamest parts of the first one and continues here. This coming from the guy who did ‘(500) Days of Summer‘.